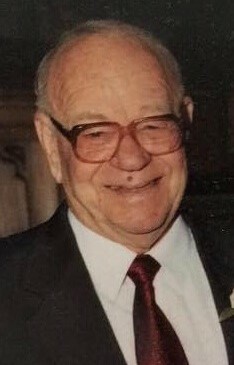 Obituary for Gerald "Bud" Leo Murrow | Lanman Funeral Home, Inc.
Funeral service for Bud Murrow will be Saturday, December 1, 2018 at 10:30 a.m. at the Apostolic Christian Church in Kiowa with burial at Riverview Cemetery. Viewing will be Friday, November 30, 2018 from 1:00 p.m. to 8:00 p.m. Arrangements are by Lanman Funeral Home, Inc. of Kiowa. www.lanmanmemorials.com Facebook: Lanman Funeral Home Inc.
Gerald “Bud” Leo Murrow was born April 8, 1926 and passed away November 26, 2018. He was born in Alva, Oklahoma, the son of Dora Mae Eisenhower Murrow and William Isaac Murrow and spent his early years living there, as well as in Freedom and Dacoma. He was working by the time he was ten years old, watching cattle on the open range alone. His father and uncles raised and broke horses for the military while he was growing up. He told many stories about those years. He married the only love of his life, Helen Elaine Roth, on July 24, 1947. Their marriage was blessed with three daughters: Gayle Elaine, Janet Lea and Lynne Marie. He worked many years as a carpenter, along with farming and working nights as a policeman. He and Helen took over Meyer-Murrow Construction in 1976 and worked together in that business until their retirement. Over the years they enjoyed many trips to Illinois to see Helen’s family, trips to Colorado and to several other states. In their retirement they enjoyed winters spent in Texas and made many good friends there. He was preceded in death by his wife, Helen; granddaughter, Jeanette Elaine Robb; sisters, Edna Wallace, Lula Wallace, Rella Courson and Patsy Hamilton; brother, Jerald. He will be greatly missed by daughters, Gayle Robb of Cunningham, Janet (Burton) Smith of Kiowa, Lynne (Shawn) Johnson of Kiowa; six grandchildren; fifteen great-grandchildren; six great-great grandchildren; one sister, Wildora Zednick; sister-in-law, Norleen Polson Murrow and nieces and nephews. Memorials may be made to the Apostolic Christian Church through the funeral home.